This week, Amazon updated its popular iOS Amazon Instant Video app for AirPlay support. That’s right, now you can watch Amazon videos streamed via your Apple TV using your iOS device or Mac. Like in the iTunes Movie Store, the new Instant Video update also includes for each movie the IMDB cast and director information, customer ratings and reviews, and a scrolling set of videos watched by customers who watched the current selection. Amazon Instant Video provides unlimited streaming of more than 40,000 movies and TV episodes, available to customers with an Amazon Prime membership. The advantage of Amazon Instant Videos over Apple’s movie service is that there’s no limit to the amount of times you can watch streaming videos, as long as they exist in the catalog. 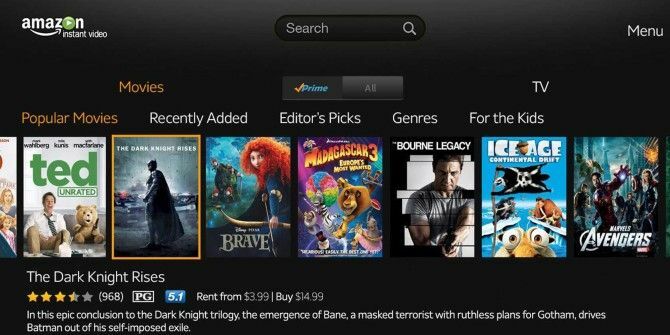 The app also allows you to rent or purchase videos from the Amazon store, and add selected videos to your Watchlist. Amazon Instant Videos can only be streamed over Wi-Fi. A cellular connection is not supported. Downloaded purchased and rented videos do not require a Wi-Fi connection. You can’t stream movies via AirPlay to your Mac; instead, you will need to watch them from the Amazon website on a supported web browser. The Amazon Instant Video app also includes Whipersync technology for automatically syncing the content you’re watching, and where you left off, between all your supported devices, including your iOS device, Kindle Fire HD, PlayStation 3, Xbox, and PC or Mac. The new Instant Video to AppleTV upgrade means greater access to the service, though Instant Video will probably never be available directly on AppleTV. Let us know if you find this upgrade useful. Why is cellular data networks not usable with Amazon instantvideo? Hmmm, Justin, I'm not sure. Perhaps it's a bandwidth issue? Same trouble here. I was hoping the Amazon Instant video app would play from my iPad to TV via Apple's HDMI adapter, but it doesn't seem to work. Is the update only if you're using Apple TV? You might try checking out the Apple Support website to see if other users have come up with a solution. I also did all the updates to my iPhone 5, the Amazon app, and to my new Apple TV, and I still get the message that it is not supported. Any help would be greatly appreciated! My iphone, iPad, and Apple TV have all been updated, including the apps, and it still gives me the same message. I'm currently just on the 30 day trial; I don't want to purchase Amazon Prime unless it's guaranteed to play on the Apple TV. Mine still won't play on Apple TV. Continues to say: "Watching videos while mirroring is currently unavailable with this app." Any thoughts or suggestions? You have to upgrade the iPad/iphone app before the new features become available. I'm glad the Apple TV plays Amazon Prime videos, since my new TiVo doesn't and it's not easy on my XBox 360. Apple TV is pretty handy for such a tiny device. Now, if I can just stop losing the tinier remote control. Jim, if you have an iPhone, you can download the remote app also. Its really good app. Actually i find good Mobile app in amazon site. Miki, great, thanks for letting know.